Low Impact Building: Housing using Renewable Materials is about changing the way we build houses to reduce their ‘carbon’ footprint and to minimise environmental damage. One of the ways this can be done is by reducing the energy and environmental impact of the materials and resources used to construct buildings by choosing alternative products and systems. In particular, we need to recognise the potential for using natural and renewable construction materials as a way to reduce both carbon emissions but also build in a more benign and healthy way. This book is an account of some attempts to introduce this into mainstream house construction and the problems and obstacles that need to be overcome to gain wider acceptance of genuinely environmental construction methods. 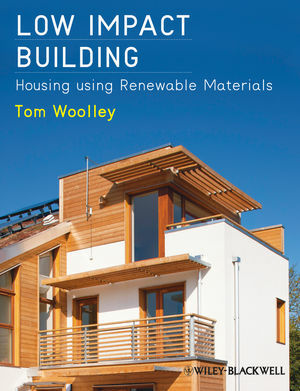 Tom Woolley is an architect and educator and self-builder. He has taught at the Architectural Association, Strathclyde University, Hull School of Architecture, Queens University Belfast, University of Central Lancashire, UiTM in Malaysia, University of Umea, the Centre for Alternative Technology in Wales, University of Bath and University of Gloucestershire. His research work and writing has covered housing policy, sustainable materials and design theory. He is active in the Co-operative party, ARC-PEACE and Scientists for Global Responsibility. He has helped to establish the Alliance for Sustainable Building Products in the UK. Working with Rachel Bevan Architects in County Down in Northern Ireland, he is also involved in organic gardening and sustainable woodland management.